How Did You Become My Enemy? What Does Nonviolence Mean to Me? Terri’s personal note: Although this book deals with the ending of primary romantic relationships, I was initially attracted to it as an aid in reflecting on the re-definition of a family relationship. As I read, I began reflecting on other relationships as well, from love relationships long over, to newly forming friendships. I had several personal insights, making it worth the read. Updating our ideas of relationship, and the romantic myth of living happily ever after, may help us understand and work through the process of ending relationships. 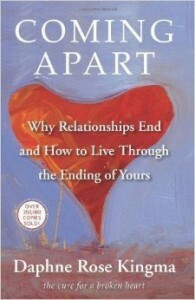 The author’s premise is that “relationships are one of the most important vehicles by which we create our identities and through which we define ourselves.” Kingma says that in our developmental process, we each have a series of developmental tasks to complete, and we are drawn to begin, and to end, relationships based on whether they support our developmental needs at the time. There are several kinds of developmental tasks. One set is external and task-oriented, such as starting a business, building a home, and having children. Another set, psychological developmental tasks, “fall basically into two categories: 1) making up for specific deficits from childhood, and 2) discovering the emotional meanings of our childhood stories.” Kingma subscribes to the theory that “we live our lives based on emotional patterns we learned as children.” We choose relationships, and they choose us, in order to learn and grow. When the goals, or developmental tasks, of this specific relationship have been met by one or both people, the relationship ends. Looked at this way, the ending of a relationship is not a failure, but a completion and readiness to move on. Personal note: I was struck by this comment in the book. I had been devastated when a partner left abruptly years ago, and I wondered what my participation might have been in the ending. I dug out journals from that time period, and I didn’t have to look very far. In hindsight, from reading journal entries from the weeks preceding his departure, I can see I was so focused on making the relationship work, that I hadn’t wanted to see that the relationship was no longer working – for either of us. It was helpful to keep my personal history in mind as I read on in the book, and began exploring the author’s recommended process for parting. Much of this author’s recommended process is similar to The Grief Recovery Handbook (John James, Russell Friedman) and other books I’ve read and worked with. And I discovered some new insights, such as the importance of remembering the love story, and looking back for the point at which ‘something snapped’. The author provides a clear process for working through the ending of the relationship, to our own healing and resolution. She also presents a ritual that couples can work through together, with several suggestions for couples who may chose to take that route. I found this book engaging and thought provoking, and I would recommend it for those wanting to deepen their understanding and learning from relationship transitions.